Rep. Ilhan Omar, D-Minn., has unleashed a barrage of openly anti-Semitic commentary. She suggested that Israel had "hypnotized the world." She recently suggested that Jewish money lay behind American support for Israel. Finally, she suggested that American Israel supporters are representatives of dual loyalty. Her fellow Democrats shielded her from blowback by subsuming a resolution that condemns her anti-Semitism within a broader resolution that condemns intolerance of all types. Many of them suggested that labeling Omar's anti-Semitism actually represents a type of censorship -- an attempt to quash debate about Israel, though none of Omar's comments even critiqued the Israeli government, and though many on the left have made anti-Israel arguments without invoking anti-Semitism. Now Omar's defenders have come out of the woodwork to suggest that criticism of her anti-Semitism was somehow responsible for the white supremacist shooting of 50 innocent people in two mosques in Christchurch, New Zealand. Two protesters, New York University students and best friends Leen Dweik and Rose Asaf, confronted Chelsea Clinton, who had gently chided Omar for her Jew hatred. 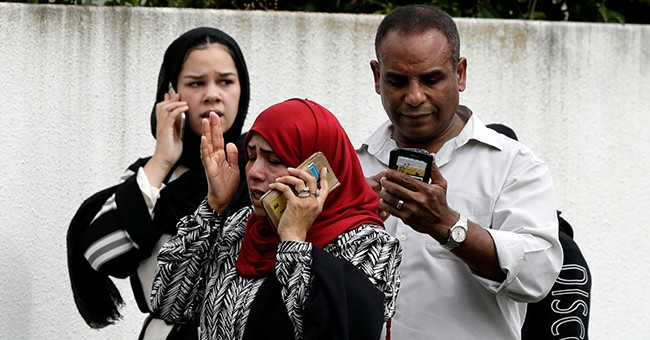 "After all that you have done, all the Islamophobia that you have stoked," Dweik screamed, "this, right here, is the result of a massacre stoked by people like you and the words you put out in the world. ... Forty-nine people died because of the rhetoric you put out there." Dweik, it should be noted, has called for the complete elimination of Israel. Her message was parroted by terror supporter Linda Sarsour, who tweeted: "I am triggered by those who piled on Representative Ilhan Omar and incited a hate mob against her until she got assassination threats now giving condolences to our community. What we need you to do is reflect on how you contribute to islamophobia and stop doing that." Meanwhile, mainstream commentators attempted to use the New Zealand anti-Muslim terror attack to blame critics of radical Islam. Omer Aziz, writing for The New York Times, slammed Jordan Peterson for calling Islamophobia "a word created by fascists" and Sam Harris for calling it "intellectual blood libel." Bill Maher has come in for similar criticism; so have I, mostly for a video I cut in 2014 in which I read off poll statistics from various Muslim countries on a variety of topics, concluding that a huge percentage of Muslims believed radical things. Here's the truth: Radical Islam is dangerous. The Islamic world has a serious problem with radical Islam. And large swaths of the Muslim world are, in fact, hostile to Western views on matters ranging from freedom of speech to women's rights. To conflate that obvious truth with the desire to murder innocents in Christchurch is intellectual dishonesty of the highest sort. If we want more Muslims living in liberty and freedom, we must certainly demolish white supremacism -- and we must also demolish radical Islam, devotees of which were responsible for an estimated 84,000 deaths in 2017 alone, most of those victims Muslim. And here's another truth: Anti-Semitism is ugly, whether it's coming from white supremacists or Ilhan Omar. Making that point has nothing to do with the killing of Muslims in Christchurch. So long as the media continue to push the narrative that criticism of Islam is tantamount to incitement of murder, radical Islam will continue to flourish. So long as the media continue to cover for the dishonest argument that criticism of anti-Semitism forwards the goals of white supremacists, anti-Semitism will continue to flourish. Honest discussion about hard issues isn't incitement.